Pneumocystis carinii, when examined using molecular techniques, most closely resembles a fungus. Stains of either bronchoalveolar-lavage (BAL) or transbronchial-biopsy samples yield a diagnosis in > 90% of patients and should be considered the gold standard in diagnosis. BAL with transbronchial biopsy increases diagnostic yield to ~ 100%. P carinii has not yet been cultured in vitro. Polymerase chain reaction (PCR) (especially on sputum) increases sensitivity but reduces specificity. The prophylactic use of aerosolized pentamidine reduces the sensitivity of sputum and bronchoscopic samples. In 1983, P carinii pneumonia (PCP) was described as the AIDS-defining illness in = 60% of the first 1000 patients diagnosed with AIDS in the United States. Subsequently, the advent of prophylactic measures has reduced the incidence of PCP presenting as the initial diagnosis for AIDS to < 50% of cases. In addition, the hospitalization rate is also declining for patients with AIDS who also have PCP. This decline has presumably been caused by successful use of prophylaxis against the organism. An analysis from Ontario, Canada, demonstrated that hospital admissions caused by PCP decreased from 48% to 29% over a 2-year period with the initiation of prophylaxis with aerosolized pentamidine. Another Canadian study tracked PCP cases over the decade from 1981 to 1991 and showed that PCP episodes peaked in 1989 and subsequently began to decline. Of AIDS patients who do not receive prophylaxis against P carinii, = 80% will develop at least one episode of PCP and ~ 25% of AIDS patients not receiving prophylaxis will die from PCP. Of patients who have experienced PCP as their AIDS-defining illness, = 70% will develop recurrent disease in the ensuing 2 years without the use of prophylactic medication, and 50% of these cases will occur in the 9 months after the initial episode. CD4 lymphocyte levels in immunocompromised patients have become the most useful factor in predicting risk for developing P carinii infections. Retrospective data have demonstrated that PCP rarely occurs in patients with CD4+ counts of > 200 cells/mm3 and that > 90% of AIDS patients will have a CD4 count of < 200 cells/mm3 in the 2 months before becoming infected with P carinii. The percentage of lymphocytes that are CD4 also seems an important prognostic factor because > 95% of patients had a CD4+ percentage of < 20% in the 2 months before infection. Although P carinii infection in children is clinically similar to that seen in adults, the numbers of CD4 lymphocytes in pediatric patients differ from those of adults and vary by the age of the patient. The relationship of the CD4 count and the age of a child must be understood to ascertain the degree of immunosuppression. Severe immunosuppression in children < 12 months old is seen with a total CD4 count of < 750 cells/mm3 or a CD4 percentage of < 15%. For HIV-infected children between 1 and 5 years old, a CD4 T-lymphocyte count of < 500 cells/mm3 or a CD4 percentage of < 15% is indicative of immunosuppression and increased risk for PCP. New information suggests that PCP occurs as a result of transmission from human hosts and not from reactivation of latent infection as once thought. The organism is probably not maintained in the lungs of immunocompetent humans for any significant period, and it has been difficult to detect in normal individuals at autopsy. Further support for the theory of person-to-person spread is that PCP infections seem to peak ~ 4 months after winter viruses. The organism may be spread via aerosolized secretions by persons in the community with viral infections. Clustered outbreaks of PCP also suggest person-to-person spread. Mortality in cases of mild to moderate PCP (partial arterial oxygen pressure [PaO2] = 70 mm Hg and alveolar-arterial oxygen gradient [A-a] = 35 mm Hg) has substantially decreased as physicians treating the disease have gained experience. The early to mid 1980s saw mortality rates of = 25% in mild to moderate disease. More recent large, multicenter trials have demonstrated mortality rates of < 1%. However, patients with PCP who develop respiratory failure still suffer profound mortality rates (= 45-72%). P carinii is an obligate extracellular organism that characteristically evolves from a trophozoite of a single cell into a 5- to 10-mm-diameter cyst that contains up to eight sporozoites, each 1 to 2 mm in size. The developed cysts release sporozoites, which evolve into trophozoites. The majority of organisms in pulmonary tissue exist in the trophozoite form. The molecular biology of P carinii is interesting, and new discoveries have led to significant modification in the understanding and classification of this organism. P carinii has long been considered a member of the protozoan kingdom. However, in 1988, P carinii ribosomal RNA sequences were found to more closely parallel certain fungal ribosomal RNA sequences. More recent inspection of P carinii gene sequences and fungal sequences from each of the seven fungal phyla seems to suggest that P carinii is a fungal organism. In particular, there appears a noticeable morphologic similarity between P carinii and the ustomycetous red yeast fungi, which is evidenced by a striking resemblance in mitochondrial RNA segments by PCR analysis. It is interesting that the strain of P carinii that infects organisms may not be clonal. Within humans, the organism appears to be genetically diverse; isolates from four distinctly different geographic regions of the world show DNA diversity. Different mammalian hosts appear to harbor genetically diverse strains of P carinii as well. P carinii has been proven unable to grow when organisms from one species are deposited in the lungs of a differing species. Recent data continue to suggest that P carinii infections are acquired via inhalation between hosts. Thus, infectious episodes are thought to occur as a result of reinfection and are not caused by reactivation of latent organisms. Once acquired, the organisms seem to adhere to alveolar cells of the lung. Replication of the organism is slow, and the resultant host immune response is relatively deliberate as well. Impaired gas exchange at the alveolar level, a hallmark of PCP infection, appears to be caused by both the extensive proliferation of P carinii organisms and the subsequent host response. The presence of a foamy alveolar exudate, alveolar macrophages, interstitial edema, and type I alveolar cell destruction has been demonstrated by electron and light microscopy during the course of infection. The efficacy of corticosteroids in moderate to severe PCP infection is presumably caused by blunting of the host immune response. The importance of the correlation between the degree of immune response and the severity of disease is supported by the association between the number of neutrophils seen on BAL specimens and increased mortality. The triad of shortness of breath with exertion, nonproductive cough, and fever describes the typical case of PCP (Box 1). Symptoms are usually slow to progress and typically worsen over several weeks to months. Cough may be productive of purulent sputum, especially if the patient is concomitantly infected with a bacterial pathogen. Shortness of breath at rest occurs late in the course of disease and signals moderate to severe hypoxia. The physical exam is relatively nonspecific in diagnosing PCP because = 50% of patients may have normal pulmonary examinations. Fine rales may be auscultated in = 40% of patients, most with severe PCP. Patients may have restriction of their inspiratory ability, which is usually not mentioned unless the patient is questioned specifically. The serum lactate dehydrogenase (LDH) level has long been considered a useful laboratory value in the diagnosis of PCP. However, although LDH sensitivity may be > 80%, the test lacks specificity. The serum LDH level does appear to be of prognostic value. Serum LDH levels have been shown to portend a poor prognosis and increased mortality if they are elevated at diagnosis or if they persistently rise despite treatment. The chest radiograph is an important tool in the assessment of patients thought to be infected with PCP. Although nearly any pattern may be seen on chest radiograph, the typical appearance seen in ~ 80% of cases is one of diffuse bilateral interstitial infiltrates. Chest radiographs that show consolidation, nodularity, or cavitations may be seen in < 5% of cases. The finding of pneumothoraces, cysts, or pneumatoceles is not uncommon in patients with advanced disease. 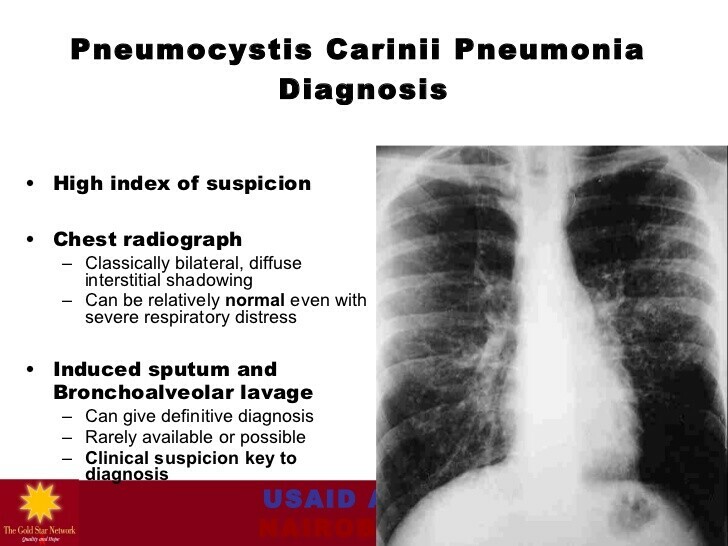 Of patients with PCP, = 10% may have cysts (as seen on chest radiographs) and = 6% may have pneumothoraces. 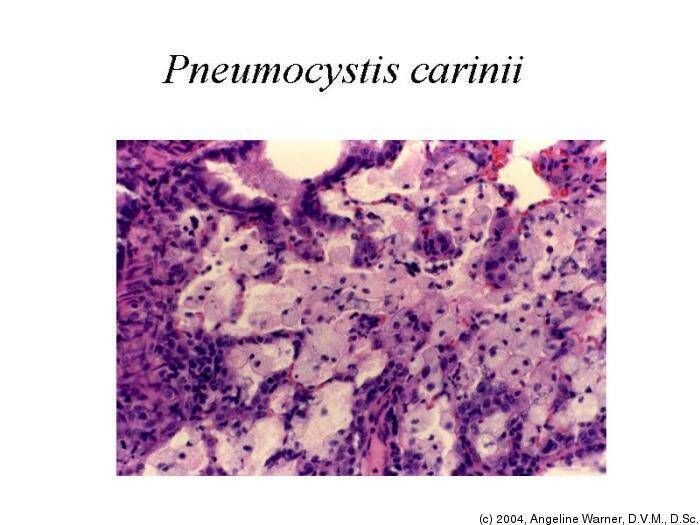 The vast majority of AIDS patients with a pneumothorax have active P carinii infections. Corticosteroids (prednisone) are currently recommended in patients with PO <70 mm Hg or an alveolar-arterial oxygen gradient (P(A-a)0) >35 mm Hg. Patients with severe disease should probably receive 4 mg of petamidine. Folinic acid must be administered at the initiation of trimetrexate therapy and continued for 3 d after cessation of therapy. Atovaquone should be taken with food; failure to do so may result in threefold reduction in absorption. 1Oral therapy should be reserved for those with mild disease and no evidence of malaborption or diarrhea.